Ripple is now everywhere or almost everywhere. Since a couple of years, the ripple has managed itself well and its main focus is on increasing partnerships and listing on more cryptocurrency trading platform. Coinberry is a user-friendly, FINTRAC registered, Toronto based cryptocurrency trading platform. It is a quick, convenient and easy which allow Canadians to buy Bitcoin and few more cryptocurrencies using bank transfers. It is one of the best and renowned trading platforms in Canada. 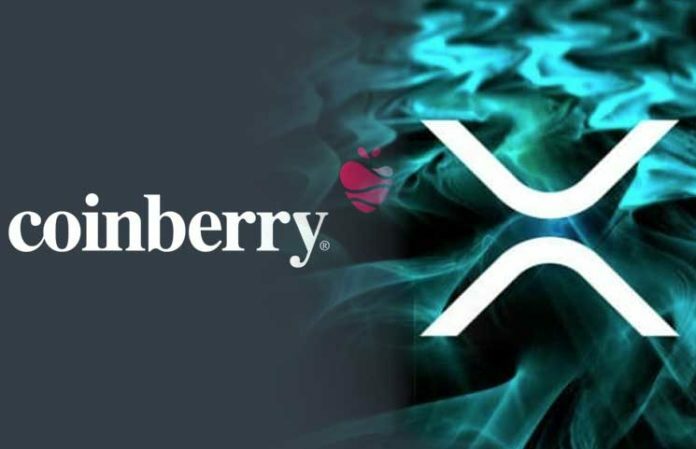 Today we are introducing XRP to the coinberry platform. You can buy/sell or HODL all the XRP you want. Ripple has been through a lot. It has been through the good phases and the bad phases. Despite everything Ripple did not fail to impress the traders and investors with something new or exciting. Be its new partnership with banks or any institution or listing on trading platforms. The number of exchanges has adopted XRP in 2018 and the trend still goes on. There has been multiple good news at the Ripple end in all these terms. These companies and institutions are looking forward to adopting or integrate with ripple because of its unbeatable transaction speed and security. The banks and the institutions adopting Ripple believes that they can improve their services and operations with XRP token. A very recent poll says that “ripple is the most preferred cryptocurrency in its immediate circle". The poll was conducted by a UK based payment company PayGlobal and XRP happen to be at the top which ended up prioritizing XRP token over any other cryptocurrency. Getting listed on any cryptocurrency exchange is very vital for any token. The listing on the cryptocurrency exchange could make and break the impact of the token. One extra listing increases thousands of customers for both exchange and token. Cryptocurrencies may have a lot of potentials but for that potential to reach customers, they need a medium and these exchanges are the mediums. It increases the liquidity of the token and exchange both and what is the matter of being a great project or currency if traders cannot trade. Trading platforms are only medium for traders to utilize the benefit of the coin. For XRP, it is proved to be healthy and wealthy to be listed on any new cryptocurrency exchange. A couple of weeks ago Binance announced the adoption of XRP token on their platform. This listing of XRP on Binance attracted a lot of many customers, traders, investors and of course new exchanges. Binance already supports the top cryptocurrencies like Bitcoin (BTC), Litecoin (LTC), Ethereum (ETH) and now XRP too. The support on Binance platform allows users to purchase XRP token with their credit card. This environment is really sustainable and healthy for XRP token as it is a big platform with a very huge impact on the market. Just a few days later, Coinbase also announced the adoption of XRP token. Coinbase PRO also supports XRP token on its platform. Not sure if the role of Binance adopting XRP was the decision-making point in this case however it is surely a point to consider and leaving a positive check on this side. And now a new listing on Coinberry trading platform. These listings are of utmost importance for any cryptocurrency and it also presents the impression of the token to the rest of the world.